As Barack Obama finishes his first term as President-Elect and gets ready to suit up for the real thing, debate has come up between conservatives and liberals regarding the respect due him. Conservatives cite the constant derision and undeserved insults heaped upon President Bush and say that the Democrat is only getting a dose of what the liberals considered reasonable treatment of the Chief Executive for the last eight years. Liberals respond by saying that they gave Bush a fair chance, and did not being attacking him until he had earned it, that they were not spitting insults before he even began his term. I do not agree with the deliberate disrespect against Obama, but the liberals are lying to pretend they ever gave President Bush a chance. 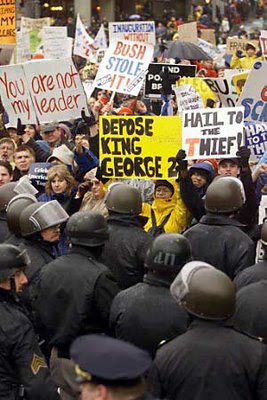 Thousands of liberals protested Bush's inauguration, pelting his motorcade with bottles and at least one egg. Before he even took office, mockery of him was common among liberals. The fact is simple - liberals refused to show respect at all to President Bush, so while it would be better for conservatives to try to work with Obama and give him a chance to do his job, it is absolutely false for liberals to pretend they have any right to expect it. If Obama never catches a break as President, he can thank his liberal base for poisoning the well. My daughter accidentally gave away her kitten today. Normally this would mean finding out where it got to, and arranging for the return the errant feline. In this case, however, my daughter managed to “donate” her kitten on her Nintendo DS game, and so far we have not been able to effectuate its return. We can “buy” a new kitten, but we cannot get the old one back. The game does not have an ‘undo’ feature. Computer games are impressive these days, but every so often you find a point where Real Life cannot be properly synthesized. I wonder how many of the “new” generation in charge of things, understand that simulations always have such flaws, or will they only find out when their projections fail badly.